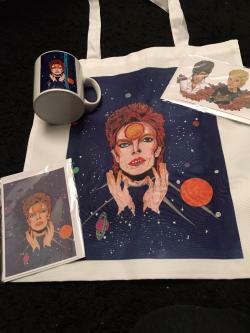 Our THIRD Charity Auction of David Bowie Art and Collectibles. 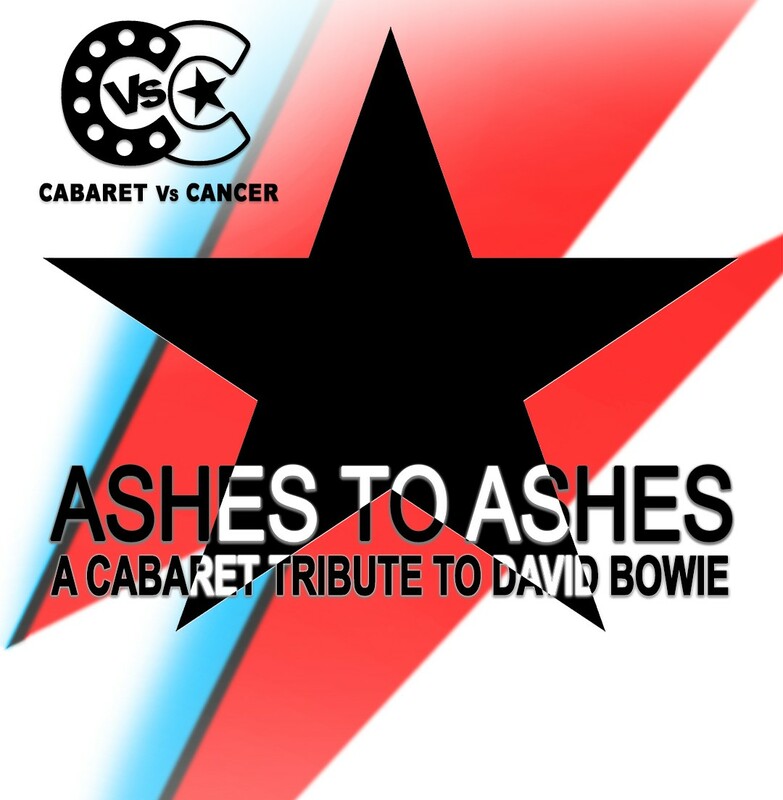 100% of net proceeds will be donated to Cabaret vs Cancer, helping those affected by cancer. All items have been donated by the artists and makers. if you're not successful please do follow the link to buy directly. 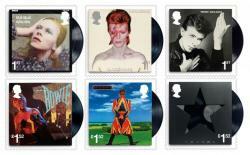 You will be required to pay actual shipping cost for your winning lot (if over £25 this will be insured shipping). 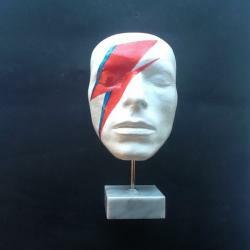 - a cast of David Bowie's face, free standing on a piece of marble. 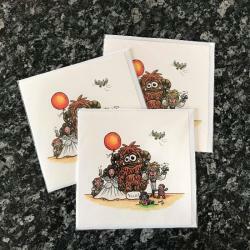 Number 22 of 100 edition and comes with a certificate of authenticity, signed and numbered by the artist, Nicholas Boxall. 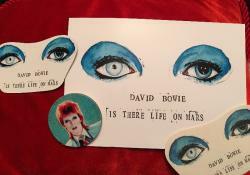 Nicholas Boxall (Sweethead) produced the White Hunger mask for the V&A Exhibition 'David Bowie Is' in 2013. 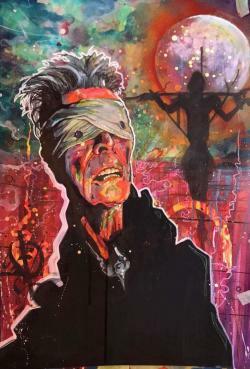 Nicholas Boxall first saw David Bowie live at The Rainbow Theatre in 1972 at the age of 14, when David Bowie inspired Nicholas to become an artist and has been influential ever since. 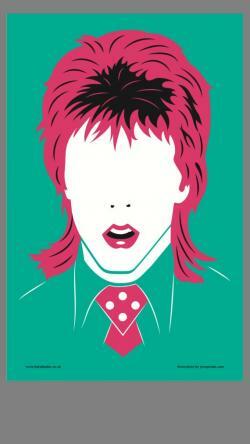 Nick has had one man shows in London and Oxford and has exhibited in Paris, Basle and Madrid. 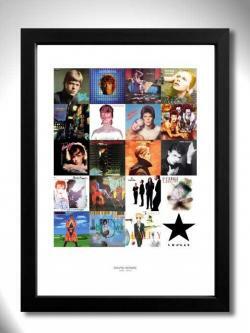 Nick’s works are also in private collections worldwide, Celebrities and Captains of industry are also collectors. 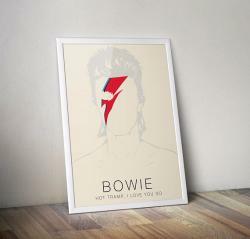 Made using a cast of David Bowie’s face circa 1975. DIRECT FROM THE DUFFY ARCHIVE! 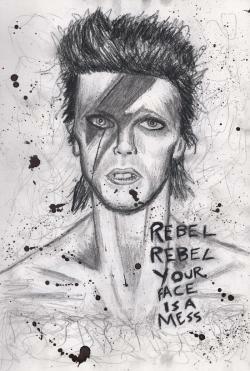 Duffy shot five sessions with David Bowie - the most iconic is the Aladdin Sane shoot. 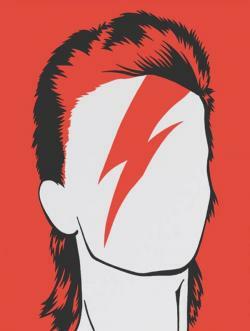 Duffy's photograph of David Bowie has been the lead image of the V&A’s 'David Bowie is' exhibition which is just about to launch at the Brooklyn Museum in New York. This auction is for a mounted A2 V&A touring edition print (retail £250). 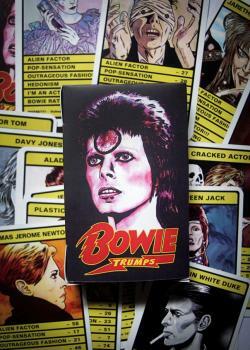 This edition of the print is NO LONGER PRODUCED so it could be considered a collectors item for a true Bowie fan. 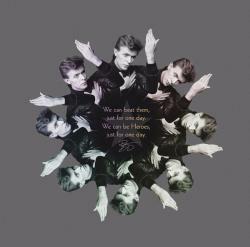 This open-editioned archival pigment ink print is embossed with the Duffy Archive stamp. On the reverse of the print is a description of the print and we hand stamp a ‘DUFFY’ logo (which is an exact replica of the stamp that was stencilled onto all of Duffy’s original camera cases). Finally, the print is sleeved in an acetate clear bag. Print measures 8x8in (23x23cm). Mounted size A2 (594x420mm). With HUGE thanks to the archive. Minimum bid is £57 (Bid increments are £2). 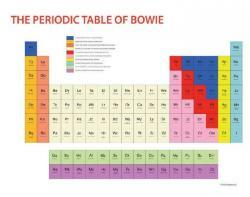 The Periodic Table of Bowie was the final artwork displayed in the V&A David Bowie is exhibition. Paul Robertson (b. 1958, Birmingham, England) is a artist-curator, well-known avant garde art-dealer and art historian, a popular if provocative art-critic, writer and broadcaster and avid art collector. 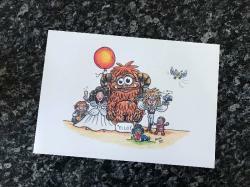 It will be posted in a tube and the print will be signed by the artist Paul Robertson. This beautiful tea towel will brighten up any kitchen and if like us you'll probably frame it! 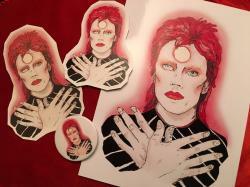 Donated by Katy Blade who collaborated with illustrator Jem Pomak and have come up with a range of Iconic dudes and dudettes to honor them and their sheer awesomness. 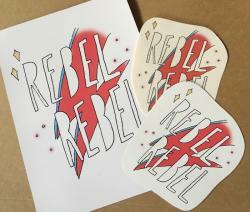 Hand screen printed in the UK, using 100% cotton and is hand finished. 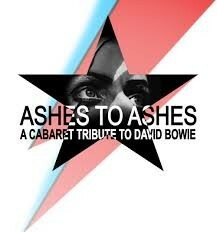 For the SECOND YEAR Nicholas Pegg has supported Cabaret vs Cancer and our Ashes to Ashes auction. Minimum bid is £38 (Bid increments are £2). Taken from an original painting done with acrylic paint on deep edge canvas. 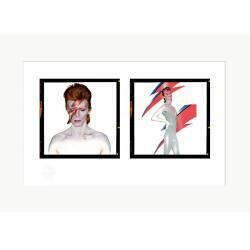 32 x 42cm outer dimensions suitable for standard frames and mounts. 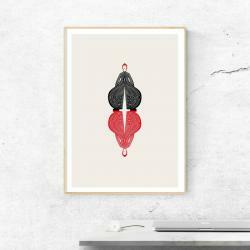 Size: A4 (8.27 x 11.69in) Printed on 300gsm thick Conqueror Paper. Like a Cat from Japan. 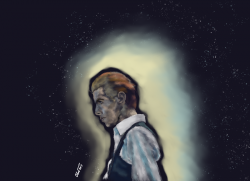 The man who fell to Earth has finally gone home, but he will live in our hearts forever. 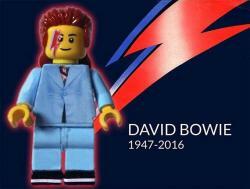 Not only is his music timeless, his contribution in the field of design cannot be underestimated. 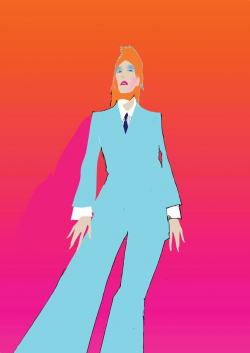 The wearing of exotic, spacey, Japan-inspired outfits by Bowie-as-alien 'Ziggy Stardust' put Japonism center stage in the fashion scene of the West, placing a seal of approval on inspirations from Japan, which in the early ’70s was still considered an indecipherable, alien nation! Minimum bid is £43 (Bid increments are £1). May vary from image as each one is a one off. 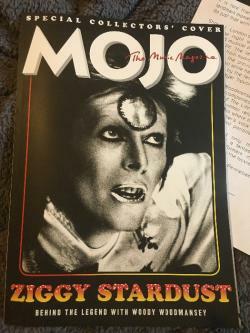 j(ay) has been a supporter of the charity since 2016, this is his third year contribution to our Ashes to Ashes auction. Minimum bid is £44 (Bid increments are £2). 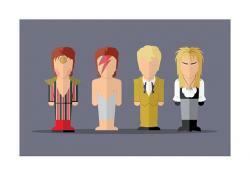 Bowie ushered in 1980 by taking his glam rock fashion stylings and going fully operatic with them. 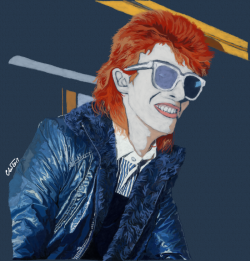 The Blue Clown, or Pierrot, was an outfit worn by Bowie in his "Ashes to Ashes" video, and was also used on the cover of Scary Monsters. In this video, he revisited his long time fascination with 'sad clown' figure Pierrot. The suit comprised a series of petal-life metallic panels, worn with shimmering tights, a white hat and pale makeup applied to look like a mask. 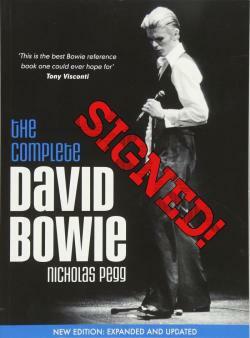 Minimum bid is £163 (Bid increments are £3). 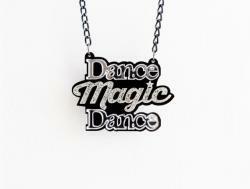 This piece is out of stock on the Bold and Noble site! 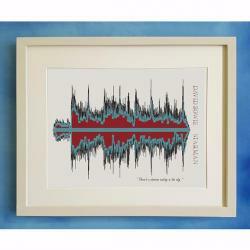 This beautifully framed piece was designed by Gary Pope as part of his 'Kaleidoscope' Collection. 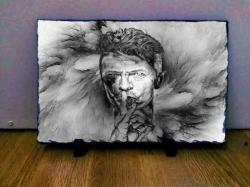 This incredible personal piece has been inspired by Gary's mum who also died of cancer, the same day as David Bowie. 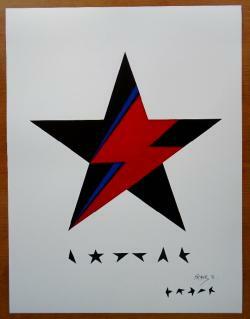 Retailing for around £250 this art piece is signed on the back by the author and comes framed. 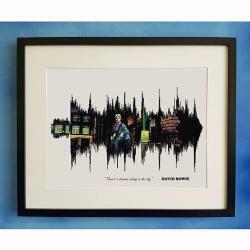 Set in a black frame, this sits at 22.5 inches square and would look awsome on your wall! 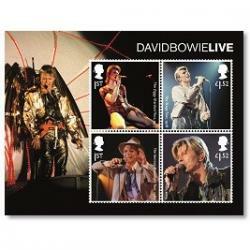 The four stamps feature live shows including the Ziggy Stardust Tour and the A Reality Tour. 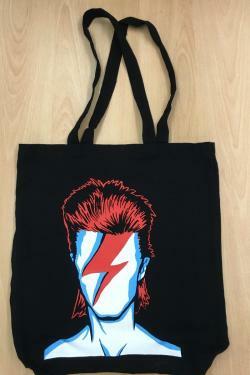 A black cotton tote bag, decorated with Cabaret vs Cancers very own Bowie artwork by Jon Attfield. 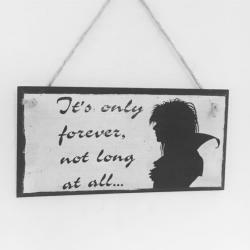 Perfect for the dedicated fan! •	Care: Wash at 40 degrees with similar colours. 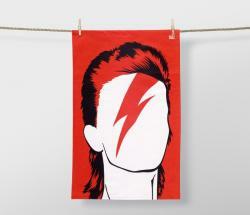 Each design is printed onto a 100% cotton tea towel using water-based inks by craftspeople in Lincolnshire. Minimum bid is £27 (Bid increments are £1). 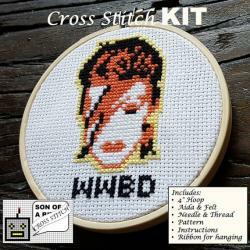 This is an ideal gift for all David Bowie fans. 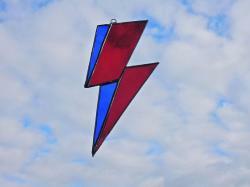 Please note the blue and red glass used may vary slightly in colour and texture from the flash in the photographs. Care: The blackened solder may oxidise in time. Simply rub with a soft cloth and a little spray polish to return to original condition. 19.8 x 20.7 cm (7.78 x 8.15 in) print. Printed on fine art paper, numbered and signed. Minimum bid is £76 (Bid increments are £2). 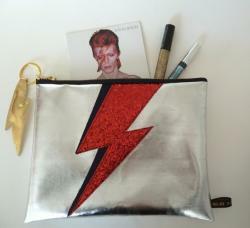 A handmade silver faux leather purse in the style of David Bowie's iconic Aladdin Sane with a red glitter lightening bolt !! The purse is made from Silver metallic faux leather with a red glitter and blue suedette lightening bolt shape appliqued on the front . 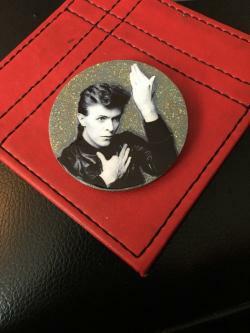 The purse has a black and metal chunky zip with a faux gold leather lightening bolt keyring which is detatchable if you wish to use it for keys. The back of the purse is plain silver. It is the right size for a clutch bag for the evening or purse in a handbag also a good size for make up and cosmetics. Will be rolled and posted in a sturdy postal tube. 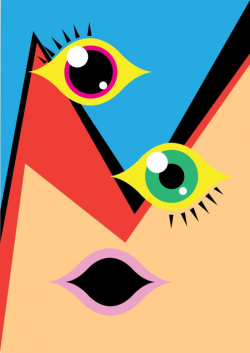 In this image Bern wanted to create a kaleidoscope of shapes that reflected 'Ziggy Stardust a the Spiders from Mars'....so this image started off much more complicated. 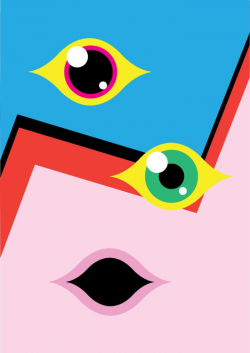 As he worked on it Bern began to remove more and more pieces from the image until all that was needed were these shapes. 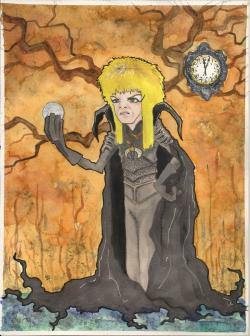 Bern is an Irish illustrator and painter living in London worked in advertising and design now full time artist in film and comic industries. 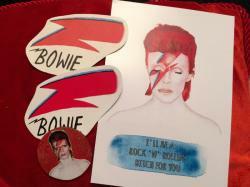 Minimum bid is £15 (Bid increments are £2). 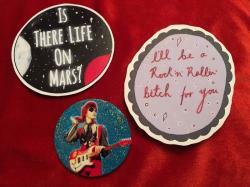 Minimum bid is £4 (Bid increments are £1). 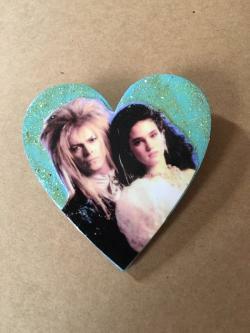 This heart shaped labyrinth badge is perfect for Bowie fans! We love it here at CvC HQ! 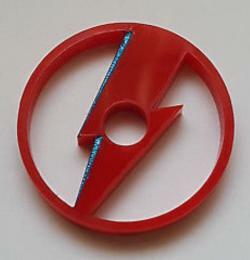 This Heroes badge is sure to be a hit! Approx 5cm and made with a lot of love! Twin Peaks - Phillip Jeffries Mug! 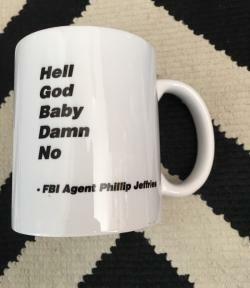 Twin Peaks themed coffee mug featuring the immortal David Bowie line of 'hell god baby damn no' from Fire Walk With Me, where he played FBI Special Agent Phillip Jeffries. Delivered in what can at best be described as an attempt at a southern accent, it's meaning will probably never be revealed. 11oz mug made with the renowned Orca coating, the best sublimation printing coating you can get. Mug is a lovely bright white unlike cheaper mugs. These are dishwasher safe. 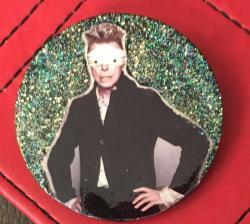 This is the third Bowie badge in the series being auctioned for Cabaret vs Cancer.